Marshall M. Fredericks Sculpture Museum | "Christ the Good Shepherd"
Installed on the front of the Central United Methodist Church in Waterford, Michigan, Fredericks cast this gold anodized sculpture in aluminum. The idea for this sculpture began during the summer of 1961 during a conversation with the minister of the church, Milton H. Bank. Fredericks worked directly with Elbert M. Wilmot, a representative from the church with respect to the proposal for this project. Following the sculpture’s installation, the church adopted the motto, “The Church of the Good Shepherd” reflecting how the congregation has embraced the iconic nature of the story of this sculpture. 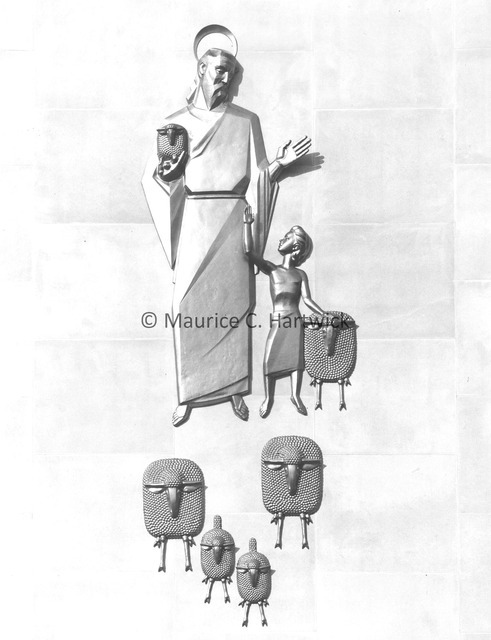 Hartwick, Maurice C., “"Christ the Good Shepherd",” Marshall M. Fredericks Sculpture Museum, accessed April 20, 2019, http://omeka.svsu.edu/items/show/795.